This was a decent paranormal show that stays under the radar-ratings were never as strong as hoped and it was cancelled after two seasons. (2003-2005) It deserves a mention, I think, because it’s not obscure, yet often forgotten. And, in my opinion, it was an interesting show that was actually getting better right before it got the ax. It starred Eliza Dushku of Buffy fame and later Dollhouse. Eliza plays a med student named Tru Davies who takes a job in the city morgue and discovers that she has the ability to relive a day in order to prevent a wrongful death. In many ways, it is similar to Ghost Whisperer-a wrongful death and a sort of sentimental journey to fix it. Except, Tru’s cases aren’t always quite as clear cut-and the series itself has a much darker edge. Tru has a brother who is a charmer with no clear direction in life and her sister is a career professional with a drug problem. The angst in strong in this show. There is a slowly developing story arc. Tru discovers that her mother shared her abilities; her estranged father reappears; and she finds another person who shares her ability. Jack Harper, played by Jason Priestly, has her power but whereas Tru wants to stop their deaths, Jack believes in fate and thinks that events should unfold without interference. The series takes on more of an edge as Tru and Jack begin to work at cross purposes in the same time events. The series also stars a younger Zach Galifianakis, not doing comedy. And A.J. Cook, later of Criminal Minds fame. The main reason I remembered Threshold -Peter Dinklage and Brent Spiner. I knew I’d seen them in a show together. Threshold was a SF thriller show involving first contact and extraterrestrials. There were thirteen episodes made (not sure how many aired). Basically, it involves a team of world experts led by Dr. Molly Caffrey (Carla Gugino) all summoned together by government agents and black helicopters etc etc. forming a task force known as Red Team. J.T. Blaylock (Charles S. Dutton) is the government liaison. Alien vessels have been encountered. Secrecy. Conspiracy theories. Brent Spiner plays a brilliant microbiologist named Fenway, Lucas Pegg is a brilliant aerospace engineer, and Arthur Ramsey (Peter Dinklage) is a brilliant mathematician and linguist. Arthur Ramsey had problems with alcohol and women-basically, he’s Tyrion Lannister. Lots of nerds. Everyone has ‘issues’ to give a few minutes drama amid conspiracy mayhem. In all seriousness, it was actually interesting. The aliens are truly alien-strange radio signals, odd fractal patterns-there is a slow, mysterious build-up to what happens and it had potential. But ratings were low. It was cancelled before it got a chance to really take off. I liked both shows. I remember seeing Threshold when it first aired (we had it in France at about the same time as the US) as I think it played on the same day as another short lived Science Fiction show of that year, Surface. 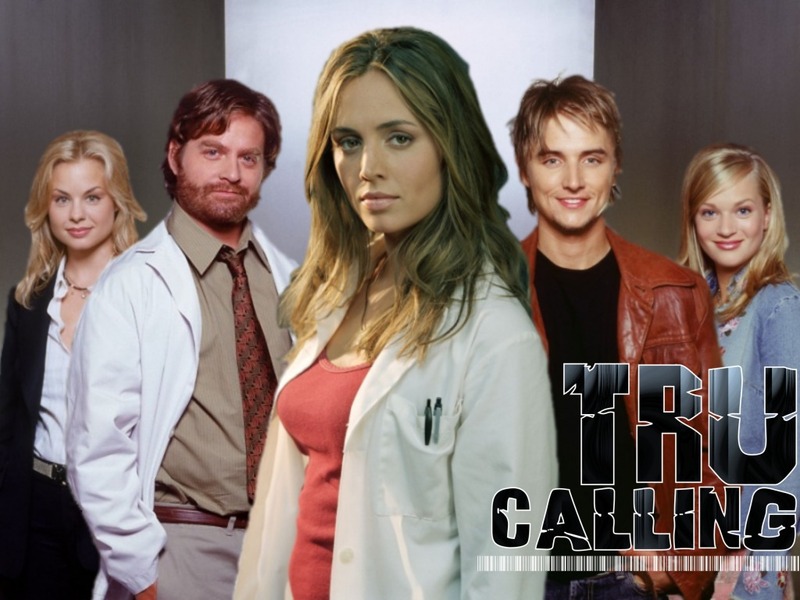 I saw Tru Calling only a few years ago. I was glad to get both on DVDs as I’ll probably use them for future research projects. SURFACE! I remember that. That’s for mentioning it. I saw Tru Calling on DVD & rather liked it. Thanks for stopping by. I liked True Calling when it was shown here in Finland. I agree that it was getting better in the second season. Haven’t seen Threshold but the aliens sound very interesting. And I’d love to see Spiner in another role. Spiner is underrated as an actor. I’ve seen him in various projects and he does a wonderful job.